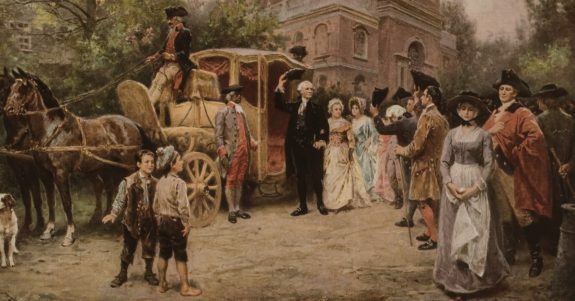 In September of 1790, President George Washington visited Philadelphia on his way south from New York City. This report about a gathering in his honor appeared in the September 8, 1790 issue of The Pennsylvania Gazette. Thursday last about two o’clock arrived in town from New York, the President of the United States — his lady and their suite. They were joined on their approach by a number of respectable citizens — the city troops of horse, artillery, and companies of light infantry, who, on this occasion, as well as others, all testified their affection for the BENEFACTOR OF MANKIND. Every public demonstration of joy was manifested; — the bells announced his welcome — a feue de joye was exhibited — and as he rode through town, to the City-Tavern, age bowed with respect and youth repeated, in acclamations, the applauses of the HERO of the Western World. At four o’clock he partook of a repast (provided by the Corporation at the City-Tavern) accompanied by the members of our Legislature and of the State Convention — by the President and other Executive Officers of Pennsylvania, at which REASON, VALOUR and HOSPITALITY presided. The King and National Assembly of France. Foreign Nations in alliance with the United States. May the United States be as firm in its support, as they were prompt in their establishment of their Constitution. The State of Pennsylvania, and success to the new Form of Government. The Friends of Liberty and Science in all nations. The memory of the deceased Patriots and Heroes of America. Liberty and good Government to all nations. OUR FRIEND, AND THE FRIEND OF MANKIND. In the evening there was a brilliant display of fireworks in Market street. On Monday morning the President of the United States proceeded on his journey to his seat in Virginia.